Adding a pop of color can enhance and add interest to any space. The colors you use in your interior design and how you use them, will greatly affect the look and feel of that space. With photos of some of our interior design projects, get inspired to use color in the following stylish ways. One of the easiest and probably most inexpensive ways to add interest to a room is by painting your walls a great color. A bold paint color will contrast nicely with neutral furniture and vice versa. If you keep your furniture and room elements neutral, you can change the wall color whenever you like and change the look and feel of your space. There are also more advanced techniques that add color to your walls that may require professional help such as tiling. With the help of a group of professional interior designers, you can add color to your walls with more unique elements like we did in this space. You can also add interest to a space with key elements such as furniture and even create a focal point with art and other accessories. Unique and modern accessories can reflect a modern style while also adding a pop of color. Keep in mind that it doesn’t have to be a large accessory. A small vase or even a throw pillow can provide enough color. In this living room we designed, not only are some of the furniture pieces a bright vibrant red, they also feature modern and unique shapes. There is a whole spectrum of colors to experiment with so have fun when choosing a color and learn more about your style preferences. Those endless color options also come in different shades. Your style and the purpose of your space are important considerations when choosing between warm, cool, and neutral colors. For example, a warm shade like red is very vibrant and modern. You may be drawn to use this color in the interior design of a living room as we did below. However, in your office you may want to use a more simple design which enhances the natural light and clean lines by using lots of white in the space as we did in this room. Home and commercial design can both use colored lighting in stylish ways. Just like paint color, there are also lots of lighting color options, each of which give a space a different feel. The lighting color can also impact the appearance of other colors and elements in the space. The way we used the various colors of lighting in Karu & Y sets a unique mood and adds interest to the entire space. There are many advantages to using one color or color scheme throughout the area of a space. The most important is that it prevents any clashing of contrasting colors. A cohesive color scheme can also make a space appear larger. You can use the color scheme in each room in a different way to add interest. In the residence below you can see that we used beautiful reds in the neighboring rooms below. Don’t be afraid to experiment with the use of color to enhance a space and reflect your style. What is your favorite way to use color in interior design? 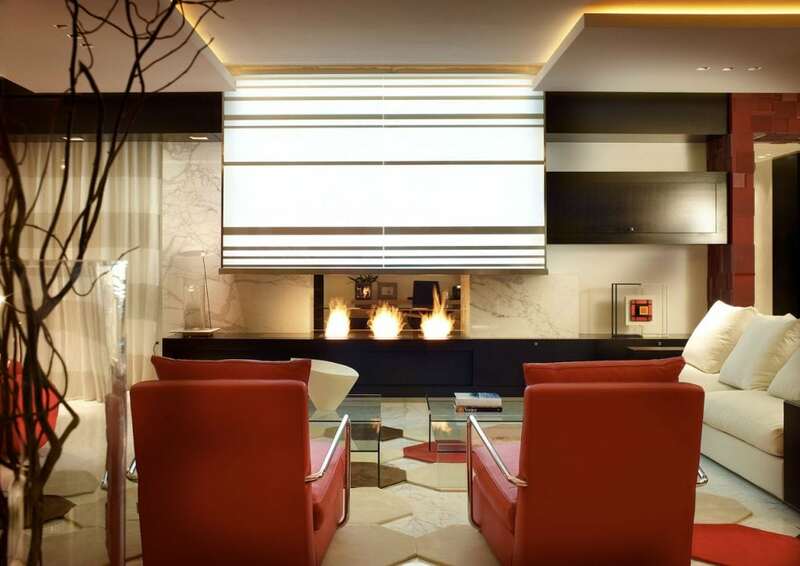 Here at the Pepe Calderin Design firm we specialize in designing modern Miami Beach apartments and other spaces with a beautiful modern style. See our use of color and modern interior design style in past projects.